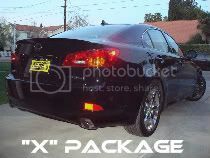 atlred wrote: Hey Mike, Not to be picky but is it (black) going to match the black of the car or is it pearl or what?? Sorry for the dumb question!! Huh? I hope I answer this right...lol. I think he means whether it'd be glossy, matte, metallic, or other... there is a "black pearl paint", but doesn't look like the black pearl emblems. Since it is a manufactured product (not painted) I would assume that it's metallic black? cklinh wrote: I think he means whether it'd be glossy, matte, metallic, or other... there is a "black pearl paint", but doesn't look like the black pearl emblems. Thanks for clarifying that up. Yes, the black should be a glossy finished, however, it's on route to my home at the moment, so I do not have the BLACK mesh in possession. I will confirm once I receive the materials. For those who are interested in the BLACK finished, please do not place orders until Monday, August 9th, 2004. However, the Chrome finished is ready to be ordered. Here's the update that you all have been waiting for. Please see page 1 of this thread for pics. The custom grilles are available in Black (semi-glossy finished) or Chrome (aluminum polished) Both finishes are anti-rust resistant. The upper grille also has the option for the reuse of the OEM Toyota emblem from the OEM grille. 3. If you purchase the upper grille (No, Emblem or Yes, to reuse of Toyota emblem) YOU MUST specify this for the upper! For those who have already purchased the lower grille, please email (michael40507@yahoo.com) me the price that you paid for and if you are interested in purchasing the upper grille. I will make special arrangements to email you individually as promised. you posted as they are being developed. I will give a discount for the Combo set purchase. Looking forward to some pics of the black mesh combo set. Here are the requested pics and there's more on my site. Here are the requested pics and there's more on my site, page 5. Here are some close ups as requested by slingshot. I hope they're what you were looking for Dave! For the black mesh, does it come with a black-matching emblem, or the silver emblem? I prefer black-matching. Those close up shots are very nice! I see you added a border around it. Makes it look nicer and it matches the bottom grille very well. got sport wrote: For the black mesh, does it come with a black-matching emblem, or the silver emblem? I prefer black-matching. LOL...You will be able to reuse your emblem from the OEM grille. So depending on what you have, that's what you will use. EDIT: I didn't want to write another post. Adding addition questions to this one. Below is an email from an inquiring customer with questions in regards to the grille that I thought would be useful. > first I have 4 questions. > 1, Do they mount with the original grill bolts? > 3, Do you have a picture of one in black? > check or cashiers check? 1. You will use the original two bolts to install the custom upper grille. 2. The grille is strong enough for a small bird/object impact. Should this ever occurs, let's hope it doesn't; but if it does, it can be shaped back into place. 3. I do not have pictures of the grille in black at this time. The black is a new product line and I will have pictures of it soon. 4. Another payment alternative to those who do not use paypal. A cashiers check or money order can be accepted, however keep in mind of mail time. Once payment has been received via USPS, I will reply with an email confirmation for security purposes. Damn, I like this shot. The chrome trim around the edges just flows with the chrome along the top. Good job! I think June will like much better. Gee, that upper grille is starting to grow on me, but I have a black car and just ordered the black lower grille. How dumb would THAT look if I decided on a chrome upper grille later! 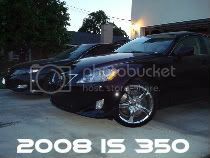 Seriously though, does anyone have a black Solara with the upper AND lower grille in chrome and can post a picture of it here, or email it to me?? Decisions, decisions . . .
MrMikeL wrote: Gee, that upper grille is starting to grow on me, but I have a black car and just ordered the black lower grille. How dumb would THAT look if I decided on a chrome upper grille later! Yeah, same here...I have a black '04, and I'm contemplating the combo set. Initially, I didn't dig the mesh, but now it's starting to grow on me, and the mesh makes it a sportier look. Last edited by DocJohn on Tue Aug 03, 2004 6:42 pm, edited 1 time in total.